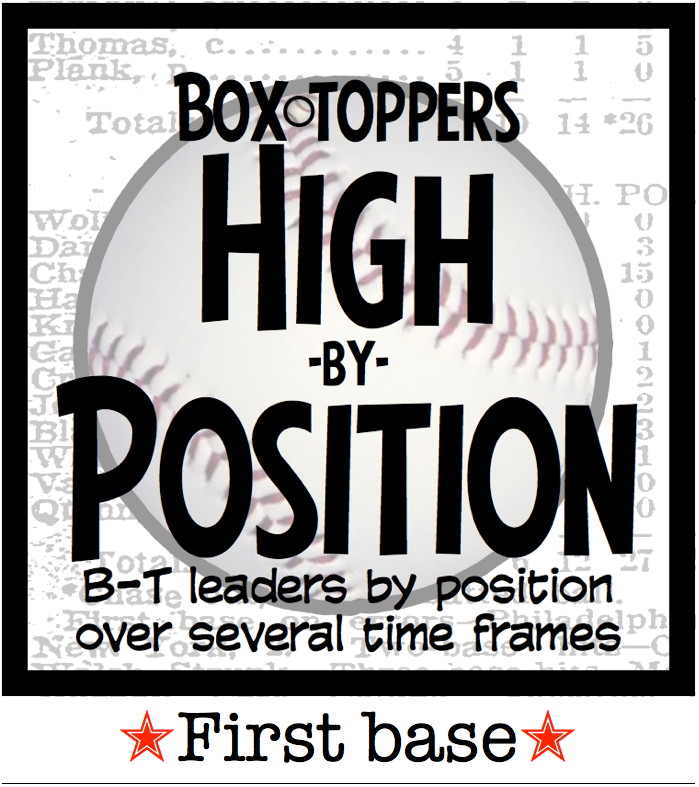 Here are the top first basemen in Box-Toppers points (BTP) over the past season (2017), the past two seasons (2016-17), the past six seasons (2012-17) and “all-time”—the past 23 seasons (since 1995, when Box-Toppers tracking began). For the most recent seasons, the top five first basemen in each league are shown. For the “all-time” rankings, the top five overall first basemen (including retired players) are shown at left and the top five active first basemen in career Box-Toppers points are shown at right. Some players played more than one position, but even if their primary position was not first base, they are listed here. Miguel Cabrera of the Tigers has the most Box-Toppers points of any first basemen since tracking began in 1995, passing previous leader Jim Thome. Cabrera has 146.9 career Box-Toppers points and in 2017 passed former player and newly elected Hall of Famer Thome, who has 146.7 points. However, since Thome’s career pre-dates the advent of Box-Toppers points (he began playing in 1991), he would likely have more career points. Rough projections put his actual career total at 154. Cabrera jumps to the top of the list of first basemen at the end of 2017, even though he only earned 2.0 Box-Toppers points in 2017, a career low. Last year, Cabrera ranked third on the “all-time” list of first basemen, behind Thome and Albert Pujols of the Angels. But because Pujols overwhelmingly played designated hitter in 2017 (and earned all his Box-Toppers Player of the Game honors while at DH), he was reclassified as solely DH, whereas in 2016, he was classified as both DH and first basemen. Pujols has 187.8 career Box-Toppers points, ranked sixth among all players since 1995, while Cabrera’s 146.9 points ranks 26th among all players since 1995. Pujols has spent the majority of his career playing first base (especially since he spent the first 11 years of his career with the Cardinals in the National League). When a player retires, Box-Toppers classifies them by the position they played the majority of their career. For Pujols, that will most likely be first base. And when that happens, Pujols, who leads all batters in Box-Toppers points since 1995, will likely retake the lead from Cabrera in “all-time” career Box-Toppers points among first basemen. But for now, Cabrera leads all first basemen in points since 1995 and also leads all active players in career points. The chart above shows the top five first basemen over several time frames. For the past season (2017), past two seasons (2016-17) and past six seasons (2012-17) the top five first basemen in each league are shown. The top five overall first basemen since 1995 (including those who have retired) are shown at the bottom left in the chart. The top five active first basemen in career Box-Toppers points are shown at the bottom right. While Cabrera did not fare well this past season, he still leads all American League first basemen over the past six seasons, with 59.8 Box-Toppers points from 2012-2017. He ranks third among AL first basemen over the previous two seasons, with 14.0 points in 2016 and 2017 (Cabrera led AL first basemen in points in 2016 with 12.0). Anthony Rizzo of the Cubs led all batters, all first basemen and all NL first basemen in Box-Toppers points in 2017 with 15.5. Rizzo also ranks first among NL first basemen over the previous two seasons with 18.5 over 2016 and 2017 (he earned only 3.0 points in 2016). Rizzo ranks second among NL first basemen over the past six seasons with 42.5 points from 2012-2017. Edwin Encarnacion of the Indians led all AL batters and all AL first basemen in Box-Toppers points in 2017 with 12.1. While Encarnacion was primarily a designated hitter in 2017, he also played first base and so is classified at both positions. He earned Player of the Game honors nine times in 2017, six times as a DH and three times at first base. Encarnacion also leads AL first basemen over the previous two seasons with 20.1 points in 2016 and 2017. He ranks second among AL first basemen over the past six seasons with 55.2 points from 2012-2017. And Encarnacion ranks fourth among all active first basemen in career points with 79.2. Paul Goldschmidt of the Diamondbacks leads NL first basemen over the past six seasons with 43.3 Box-Toppers points from 2012-2017. Goldschmidt ranked fourth among NL first basemen in 2017 with 7.4. And he ranks fifth among NL first basemen in Box-Toppers points over the past six seasons with 11.9 from 2012-2017. Of the first basemen on Box-Toppers “all-time” top five in career points, four of them are retired, including Thome, Jason Giambi (133.4 points), Carlos Delgado (117.7) and Todd Helton (116.4). Of the five who lead active first basemen in career Box-Toppers points, four of them earned Box-Toppers points during the season. Ryan Howard was signed by the Braves and the Rockies in 2017 but did not appear in a Major League game and so earned no Box-Toppers points. Howard, 38, has not announced his retirement and recently has said he plans to continue playing. He ranks third among active first basemen in career Box-Toppers points with 98.7.